(186 x 275 mm) 8.3 x 11.7 in. A3+ Size 11.7 x 17.3 in. (297 x 440 mm) 13 x 19 in. THANGKA 12.6 x 18.7 in. (321 x 475 mm) 12.6 x 18.7 in. NOTE: The original unbrocaded thangka of this Green Tara composition by Sunlal is for sale, priced at GBP £870.00. Green Tara (Tib. drol-ma jang), the “Saviouress or Liberator”, is the most well-known and beloved female deity in the Indo-Tibetan Buddhist pantheon. Legends relate that she was born from a lotus that blossomed from Avalokiteshvara’s (Tib. Chenrezig) tears of pity, and as his maternal counterpart, she vowed to remain in female form until all living beings are liberated from the sufferings of samsara or cyclic existence. As the ‘Mother of All Buddhas’ she is both the embodiment of Compassion and Perfect Wisdom, who liberates beings from the “Eight Great Fears” of: Lions (pride); Elephants (ignorance); Fire (anger); Snakes (jealousy); Thieves (false views); Captivity (avarice); Drowning (attachment), and Demons (doubt). 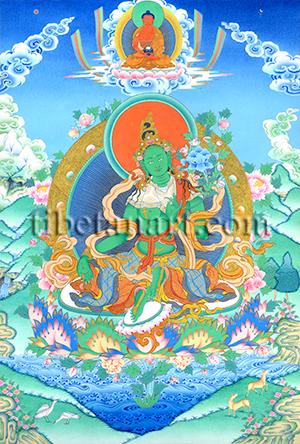 Green Tara is beautiful, peaceful, youthful like a sixteen-year-old, and emerald green in colour. Her sweetly smiling face is like a full-moon, with two lotus-like eyes that are clear, black and white, with long eyelashes like a royal bull. Her breasts are firm, full and swollen with milk, and her body exudes the fragrance of nutmeg, cloves and magnolia. Her two hands and feet are like unstained lotuses, and she was born from the tears of Padmapani Avalokiteshvara because of the vow he made to Amitabha Buddha, the "Lord of the Padma or Lotus Family" who appears above Tara in this composition. She sits upon a white moon-disc and lotus in the alidha ardha-paryanka lalita posture of ‘royal ease’, with her left leg drawn up and her right leg slightly extended with her foot resting upon a small white moon and lotus pedestal. The stylized stem of this lotus pedestal emerges from the serrated and multi-coloured petals of her lotus-throne, which in turn arises from the swirling blue waters of the lake beneath her. Her outstretched right foot shows that she has abandoned all defects, and her left left drawn up indicates her understanding of all positive qualities. Her radiant white moon disc reveals the nature of her enlightened attitude, and her lotus-seat represents her freedom from all obscurations. Tara wears an upper bodice of embroidered white silk, a red sash that encircles her upper body, lower garments of embroidered multi-coloured silks, and a long silk scarf that billows around the contours of her body. Her golden tiara is adorned with five jewels and little flowers, and she wears golden earrings, bracelets, armlets and anklets, and a jeweled necklace. Half of her long sapphire-black hair is bound-up into a topknot, while the other half hangs freely about her shoulders and back. She is crowned by green Amoghasiddhi Buddha, the "Lord of the Karma or Action Family", and her green colour represents the element of wind and her ability to swiftly accomplish all activities. She leans slightly to the left with her right hand resting upon her knee in the boon-granting varada-mudra of supreme generosity, showing that she grants realisation to all beings. And with her left hand held in front of her heart she makes the abhaya-mudra of giving refuge, indicating that she protects all beings from terror and fear. With the third finger and thumb of this hand she holds the stem of an immaculate blue utpala lotus flower that blossoms at the level of her ear, symbolizing her freedom from all imperfections. Enthroned amidst clouds and rainbows above Green Tara is red Amitabha Buddha, who wears the three orange-red robes of a bhikshu or monk and sits in vajra-posture upon a moon-disc and pink lotus, with his two hands resting upon his lap in the dhyana-mudra of meditation as he holds his blue alms bowl. Tara appears within a beautiful natural landscape of snow-capped mountains, hills, waterfalls, flowers, trees, and jewel-like rock formations, where the auspicious symbols of paired cranes and deer abide.